At Talented Learning, an independent learning tech market research and consulting firm, we recently compiled an obnoxious 85 question survey detailing over 450 points of LMS business, market and functional data. We collected statistically significant hard data about the global LMS market providing us unparalleled and unique insight into what LMS buyers are buying today. Most other analysts’ surveys and resulting data are the output of sending out a blast email request to 100,000 HR professions and drawing conclusions from the few hundred responses from those who have too much time on their hands and dated LMS expertise. We took the much tougher path and went to the LMS vendors one by one to get the best, most accurate and timely data. Seventy LMS vendors of all types have graciously filled it out so far. Vendors are out on the front lines winning and losing every day. They always know what is selling and what is not. When vendors lose two or three sales opportunities because of the same lacking feature, it magically shows up on their product roadmap. The functionality that exists in the collective LMS community illustrates what buyers are buying. Our survey was designed to allow us to measure and report on the popularity and scope of every LMS feature we have identified in our intensive LMS research. With the survey data we can now look at any feature or feature set and filter by LMS vendor type, vendor, business use of LMS, industry, hosting model, licensing model, region, language and many others. To say that analyzing this survey data has further brought out the mad, mad scientist in me is an understatement. Today, let’s discuss what we learned about the 2015 mobile LMS capabilities and buyer preferences. Somewhat of a surprise on the high side, 90.8% of LMS vendors say that mobile delivery is a “critical” requirement for their LMS buyers. How to accomplish mobile delivery has been the big question we wanted to answer though. Over the last few years, I’ve read and written chronicles of conjecture about what mobile strategy is winning in the LMS industry — mobile responsiveness or mobile apps. According to the data, the answer is both with the most progressive LMS vendors being fully mobile responsive for all users and also providing mobile apps that provide incremental capabilities. My assessment: Full mobile responsive design is the first goal of most vendors. New vendors entering the LMS market start with 100% mobile responsive for every type of LMS users. Older vendors that were born before the mobile age are retrofitting first the learner then the admin interfaces to be responsive. The most progressive vendors are fully mobile responsive for all users while providing apps that provide incremental capabilities not available in the core LMS. 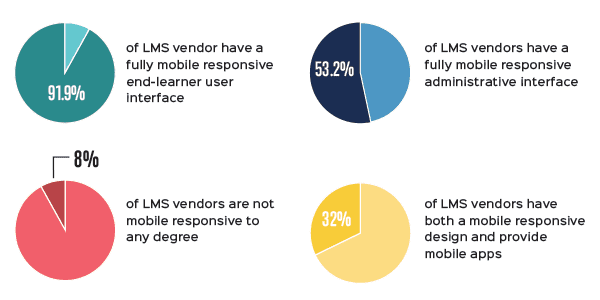 At first, most LMS mobile apps replicate varying portions of the vendor’s core LMS functionality in a mobile friendly interface. Vendors typically start with learner, then manager and finally administrator functionality. Over time, the mobile functionality expands into the innovative and cool mobile only features. Touch, swiping, offline content, location awareness, phone, camera and texting can be incorporated into various aspects of the learning process and automatically recorded in the core LMS. On the downside, apps need to be downloaded and periodically updated by every individual who wants to use them adding a substantial technical challenge and support cost for buying organizations to deploy. Vendors also have incremental costs to develop and maintain a “second” LMS. My Assessment: Mobile apps are not as popular as responsive design in the industry. A full 20% more vendors employ a responsive design vs. app for end users. Due to the additional costs and technical challenges, if mobile apps are not providing incremental features to the core LMS, they are an unnecessary headache. However, the mobile only features are really cool, innovative and have some great application in the training world. Five years ago, LMS vendors like most software companies, struggled with mobile and what to do. New vendors went right to mobile responsive and older vendors dabbled in apps because retrofitting mobile responsive is difficult and expensive. 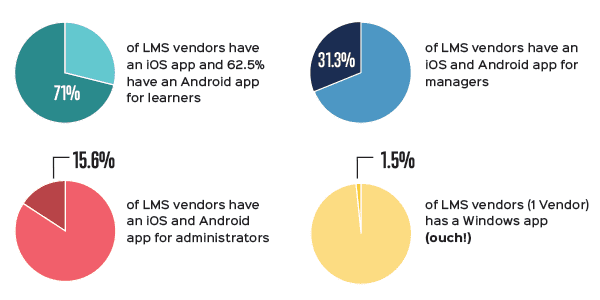 In 2015, LMS vendors have it figured out and use varying combinations of responsive and mobile apps. Mobile responsive is practical. Mobile apps are innovative. The best strategy is a fully mobile responsive LMS with apps as a bonus. That’s where the data says it is going.